With our own AIS receiver installation (at our office at Hub Creatic in Nantes), we can observe the position of the 'Vladivostok' military vessel. An aerial view shows the Mistral-class helicopter carrier Vladivostok constructed for Russia at the STX Les Chantiers de l'Atlantique shipyard site in the port of Montoir-de-Bretagne near Saint Nazaire, western France, September 22, 2014. The MMSI recorded in the AIS transceiver is 227 022 600. 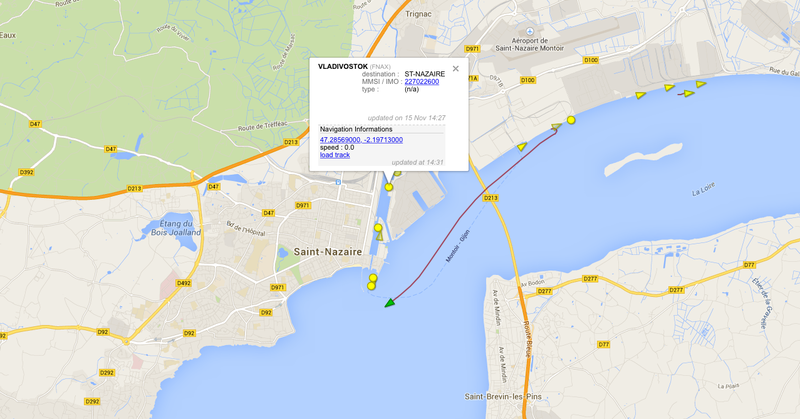 Note : in the case where the ship is officially delivered by France to Russia, the MMSI might change to 273 for Russia. apparently this change of MMSI (273 549 920) was a test according DCNS, ordered by Veritas Bureau for delivering a future certificate of navigation. Prime Minister Manuel Valls said on Friday that France would not be dictated to after an unidentified Russian official was quoted as giving Paris two weeks to deliver the first of two Mistral helicopter carriers or face possible compensation claims. France has for months resisted pressure from Washington and other allies to scrap the 1.2 billion euro ($1.58 billion) contract and in September said it would only hand over the first carrier, the Vladivostok, if there was a lasting ceasefire and a political settlement in Ukraine. With the situation worsening on the ground in Ukraine, France has again come under fire over the deal, while Moscow has tried to drive a wedge between Paris and its allies on the issue knowing that failure to deliver the carriers could damage France's image at a time when it is finalising other military contracts. 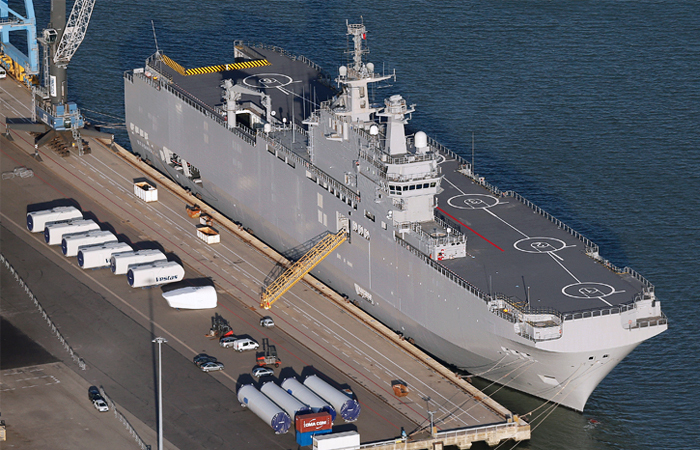 "Today, the conditions to deliver the Mistral aren't there," Valls told reporters. "France honours its contracts, but France is a nation that counts, wants peace in Ukraine and that makes sovereign decisions without anybody from outside dictating how it acts." 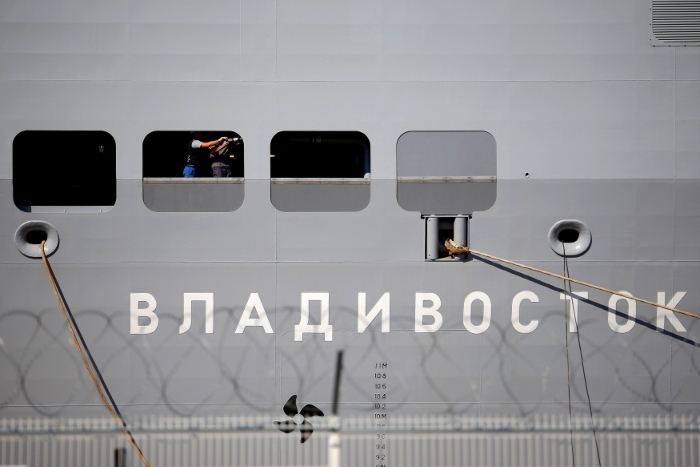 An unidentified Russian source quoted by state news agency RIA on Friday said if the Mistral was not delivered by the end of November Moscow would seek compensation. 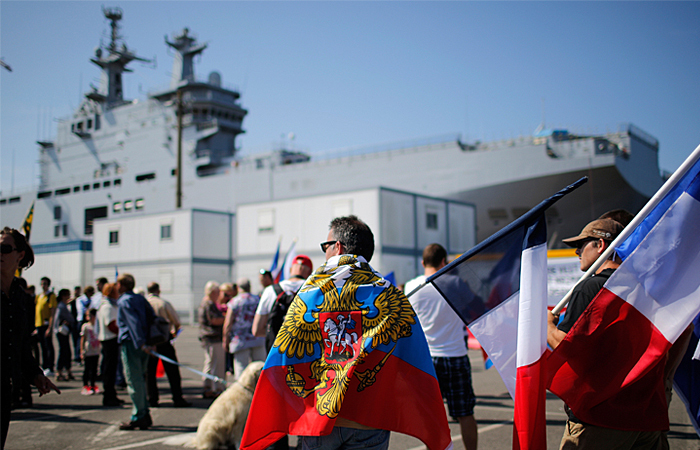 The comments were published on the day a Russian delegation, including arms exporter Rosoboronexport, had originally been invited by the Mistral's manufacturer DCNS - 65 percent-owned by the French state - to travel to France for a ceremony to transfer the first ship. "We are preparing for various scenarios. We will wait until the end of the month then we will announce some serious claims," the unidentified Russian source was quoted as saying. Analysts were looking at various amounts of compensation, the source said, adding that the sum would not be kept secret. French President Francois Hollande said at the end of October he would make a decision during November, but his defence minister, Jean-Yves Le Drian, told parliament on Wednesday DCNS had not been given the necessary government export licence. "No date for delivery can be fixed at this stage," he told lawmakers. "A definitive decision will be taken when the time comes." Europe and the United States have imposed numerous rounds of sanctions on Russia for its role in eastern Ukraine and EU foreign ministers will discuss further sanctions on Monday. Hollande is due to meet Russian President Vladimir Putin on the sidelines of the G20 leaders summit in Australia this weekend. "What's key - and the president will discuss it with several leaders during the G20 - is to rediscover the path to peace between Ukraine and Russia," Valls said. "We're far from that today." A short animated film about the feedback loops likely to lead to catastrophic climate change. The script, with extensive peer-reviewed references and additional information and links, is available at wakeupfreakout.org/ along with links to translations in more than twenty foreign languages. 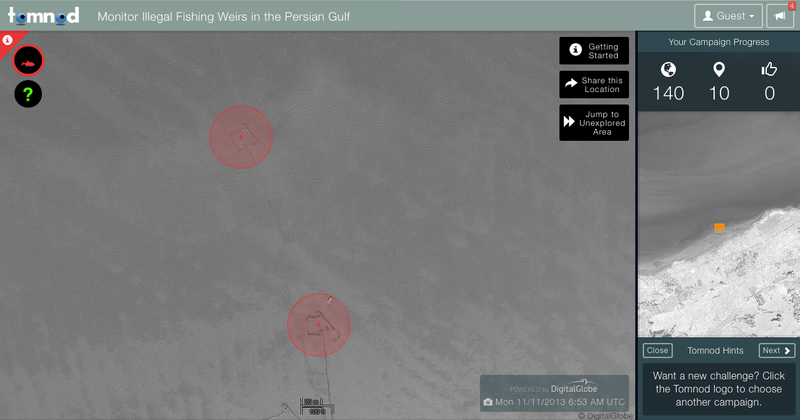 Illicit fishing goes on every day at an industrial scale. But large commercial fishers are about to get a new set of overseers: conservationists—and soon the general public—armed with space-based reconnaissance of the global fleet. Crews on big fishing boats deploy an impressive arsenal of technology—from advanced sonars to GPS navigation and mapping systems—as they chase down prey and trawl the seabed. These tools are so effective that roughly a third of the world’s fisheries are now overharvested, and more than three-quarters of the stocks that remain have hit their sustainable limits, according to the FAO. For some species, most of the catch is unreported, unregulated, or flat-out illegal. But now environmentalists are using sophisticated technology of their own to peel away that cloak of invisibility. With satellite data from SpaceQuest and financial and engineering support from Google, two environmental activist groups have built the first global surveillance system that can track large fishing vessels anywhere in the world. A prototype of the system, called Global Fishing Watch, was unveiled today at the IUCN World Parks Congress in Sydney. The tool makes use of Google’s mapping software and servers to display the tracks followed in 2012 and 2013 by some 25,000 ships that were either registered as large commercial fishers or were moving in ways that strongly suggest fishing activity. The project was led by Oceana, a marine conservation advocacy group, and the software was developed by SkyTruth, a small non-profit that specializes in using remote sensing technologies to map environmentally sensitive activities such as fracking and flaring from oil and gas fields. Although the system currently displays voyages from nearly a year ago, “the plan is that we will build out a public release version that will have near-real-time data,” said Jackie Savitz, Oceana’s VP for U.S. oceans. “Then you’ll actually be able to see someone out there fishing within hours to days,” fast enough to act on the information if the fishing is happening illegally, such as in a marine protected area. 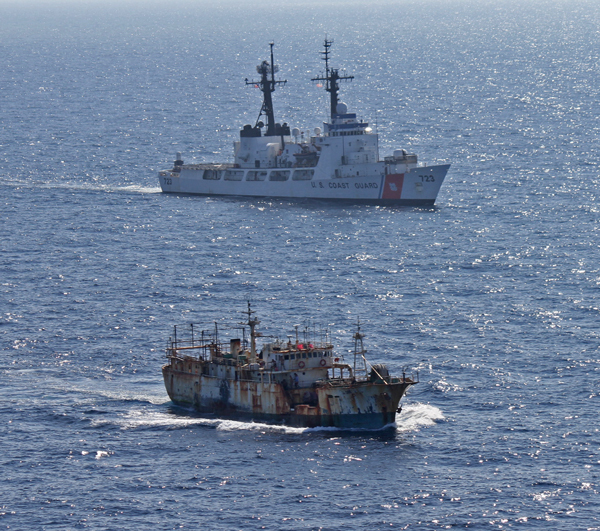 US Coast Guard cutter Rush escorting the illegal fishing boat Da Cheng back to China. The effort got its start at a conference in February, when Savitz sat down with Paul Woods of SkyTruth and Brian Sullivan of Google’s Ocean and Earth Outreach program, and the three discovered they had all been thinking along the same lines: that the pieces were in hand to put eyes on the global fishing fleet, or at least the bigger boats out there. SpaceQuest now has four satellites in orbit that continually pick up radio transmissions that large ships send out as part of their automatic identification system (AIS), broadcasts that include a unique ID number and the vessel’s current position, speed, and heading. Each packet of data is relatively small, but the total AIS data stream is massive because it captures all kinds of boats: naval warships, supertankers, barges, even some yachts. To AIS a boat is a boat; there’s no easy way to tell which ones are fishing. So the group turned to Analyze Corp., where data scientists teamed up with a former NOAA agent who worked for many years as an official fishery observer to develop a heuristic algorithm that synthesizes input such as rapid changes in trajectory, distances covered over the past 24 hours, long-term movements and port visits over months, and the self-declared identity and class of the boat. “It combines all that and spits out a weighted classification—essentially a probability that this vessel is fishing at this particular spot and time,” Woods said. 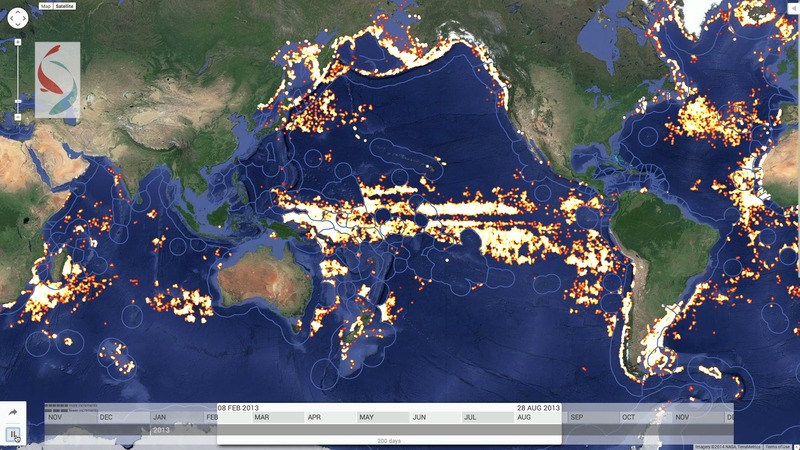 Global Fishing Watch, a prototype tool unveiled today by Google and two conservation groups, maps the voyages of 25,000 large vessels during 2012 and 2013 and highlights where they engaged in fishing behavior (yellow and orange patches). Users can zoom in to identify and track individual vessels and see where they may have engaged in unlicensed fishing in marine protected areas or other nations’ exclusive economic zones (light blue boundary lines). The filter isn’t perfect, but it winnows the data significantly. From a 1-terabyte starting set of 3.7 billion AIS messages intercepted from 111,000 vessels, the system extracted 300 million data points on about 25,000 boats that looked like they were fishing. “We were able to independently verify 3,125 of those as fishing vessels,” Woods said. He notes that the system does pick up some non-fishing activity as false positives. Arguably more important are the false negatives. Global Fishing Watch still misses most of the activity of the so-called dark fleet: smaller fishing boats that aren’t required to use AIS, and rogue fishers who turn their radios off before they enter restricted zones. Perhaps equally important, “we think this could be a tool for positive reinforcement to reward good fishing behavior,” said Brian Sullivan, a program manager with Google’s Ocean and Earth Outreach program. The next step is to open up use of the tool to everyone and plug it into a live stream of satellite data, so that ship tracks are current to within a few days. “The product really is not very far away from being a public platform,” Woods said. In the meantime, Oceana has begun using the tool internally to track vessels that have already been blacklisted for fishing illegally, Savitz said. Place a tag on every weir you see and help collect data about their usage! Fishing weirs have been used as a traditional method of fishing for a long time. However, over-use and under-reporting is having a negative effect on native fish populations. A fishing weir is a structure that can be made of stone, reeds, or wooden posts. They work by allowing water to freely flow in and the fish become trapped when they try to escape the enclosure while the tide is receding. What drives maritime piracy in sub-Saharan Africa? Southeast Asia once dominated the landscape of maritime piracy. From 1999 to 2004 Indonesia experienced nearly 100 pirate attacks per year. But just as piracy was receding in and around the Malacca Straits, attacks in the Gulfs of Guinea and Aden were on the rise. Indeed, piracy and especially hijackings exploded in the Greater Gulf of Aden after 2008. In a recent report for the Office of Naval Research in the United States, Brandon Prins examines trends in maritime piracy in Sub-Saharan Africa. Using newly collected and geo-coded data from the Maritime Piracy Event and Location Data Project (MPELD) Brandon Prins documents both the drivers of piracy in Sub-Saharan Africa and compares piracy to other forms of political violence witnessed in this region. He notes that given the tremendous social and political conflict occurring in many piracy prone countries in Sub-Saharan Africa, counter-piracy efforts at sea will likely fail. Table 1 above provides a short temporal window of piracy attacks in nine Sub-Saharan African countries. Clearly East Africa, specifically Somalia and Tanzania, and West Africa, including Nigeria in particular but other countries in the Gulf of Guinea as well, account for the vast majority of piracy observed. Table 1 also shows the dramatic decrease in piracy off Somalia beginning in 2013 and the sizable increase in the Gulf of Guinea that began in 2012. Incidents ascribed to Togo may of course be Nigerian pirates attacking transport ships as they steam towards the oil fields and platforms located in the Niger Delta. So far in 2014 there are twelve reported piracy incidents in Nigerian waters (but another 17 in the Greater Gulf of Guinea), which is slightly below the number of incidents reported in 2012 and 2013 for the same first eight months of the year. Interestingly, and perhaps worryingly, the number of incidents reported off of Somalia and Yemen in 2014 now stands at 9 (through September 17, 2014) with another 3 occurring in the Red Sea. This remains considerably fewer than the incidents observed in 2012 off Somalia (and Yemen) but is more than the total number of incidents from all of 2013. So piracy may be increasing once again off Somalia. Many of the drivers of maritime piracy are strong in Sub-Saharan African countries. Extant research shows state fragility, economic deprivation, population, and geographic opportunity all related to the incidence of piracy in territorial waters. Similar to the growth of armed insurgencies, political and economic conditions help facilitate corruption and criminality, both of which enable piracy. Indeed, countries that suffer from piracy experience much higher levels of political fragility. The Center for Systemic Peace (CSP) measures political weakness using an ordinal scale ranging from one to twenty-five, with higher values signifying increasingly fragile states (see Table 2). The average fragility score for the nine Sub-Saharan countries examined in this report (averaged across the 2009-2013 time period) is 16.8, which is 2.5 times higher than countries without piracy. The average fragility score for countries without piracy during the 2009-2013 time period is 6.6. Somalia, with an average score of 24, represents the closest thing to a failed state in the international system. 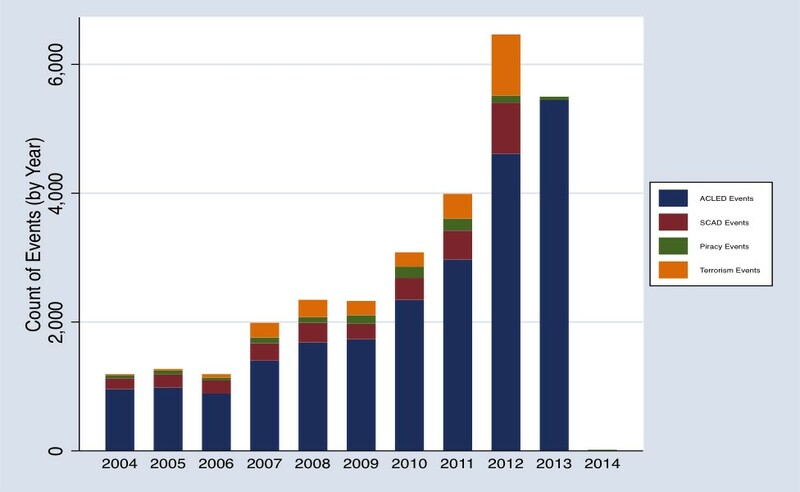 The political improvement Somalia witnessed from 2011 to 2012 (and likely into 2013 although the data for 2013 are not yet available) appears to have helped counter-piracy efforts in the Greater Gulf of Aden. Given that trade in the greater Gulf of Aden is valued at nearly one trillion US dollars a year, it is clear why would-be pirates gravitate toward these waters. Further, Somalia despite having only five deep-sea ports, sits only five kilometers from where the Red Sea empties into the Gulf of Aden, and approximately twenty thousand ships transit through the Greater Gulf of Aden each year. These vessels represent in many cases easy targets for would-be pirates. Maritime risk is not a new phenomenon. For centuries, maritime operators have sought to successfully overcome the challenges of geography, climate and technology in order to facilitate travel, trade and the quest for resources. Nevertheless, in an increasingly globalized and interconnected world, both the probability and impact of events is magnified. Tom Patterson, head of maritime analysis for Control Risks takes an in-depth look at some of the key issues featured in Maritime RiskMap 2014. Economic deprivation within countries also helps to facilitate piracy and illegal markets more generally. Unemployed youth (especially males) provide the foot soldiers both for insurgencies and pirate gangs. The average per capita gross domestic product for our nine Sub-Saharan African countries (averaged across the 2009-2013 time period) is only about $600 US dollars. The average value for countries without piracy is nearly 28 times higher, at $17,753. As Table 2 demonstrates, some of the most piracy-prone countries remain some of the poorest places on Earth. Somalia had an average per capita GDP in 2009-2013 of only $562. Nigeria was slightly higher at $1,013. Such entrenched and deep poverty poses significant challenges for any counter-piracy efforts. Convincing individual fishers or farmers to forego the opportunity of a lucrative payoff (typically several thousand US dollars) remains difficult when there are few employment alternatives. And, monies from pirate operations tend to depress job growth in the legal economy. Prices rise with cash from piracy leading to the appreciation in the value of the local currency, which tends to decrease primary commodity exports (Oliver, Jabloski, and Hastings 2013). Efforts to increase wages and job growth in piracy-prone countries must be part of an effective counter-piracy strategy. Many of the same drivers of maritime piracy also associate with other forms of violent conflict on land. The Armed Conflict Location and Event dataset (ACLED) as well as the Social Conflict in Africa database (SCAD) both record instances of political and typically violent conflict occurring on the ground in Africa. The Global Terrorism database (GTD) collects information on transnational and domestic terror attacks occurring in all countries around the world. The Oceans Beyond Piracy Project estimated the costs of Somali piracy in 2012 alone to be around $6 billion dollars. Of course, the illicit gains from piracy also drive trade in narcotics, weapons, and human slavery. Combatting these proscribed activities reduces the public coffers of already poor countries and consequently prevents investments in other areas that might spur development, reduce poverty, and improve public health (all of which would likely help drive piracy lower). Counter- trafficking programs seemingly cost billions of US dollars each year since the modest counter-piracy military operations in the Greater Gulf of Aden cost over 1 billion US dollars in 2012 (Oceans Beyond Piracy 2013). Although pirate attacks dropped dramatically off the coast of Somalia in 2013, they increased significantly in the Gulf of Guinea. Counter-piracy naval operations and improved security onboard ships likely contributed to the decline in the greater Gulf of Aden. Some strengthening in Somali governing institutions also likely had an effect even as armed conflict continued to create difficulties for the new regime. In the Gulf of Guinea, a deteriorating security environment and continued fragility in many West African governments provided space for pirate groups to operate. In Nigeria, for example, the number of conflict events on land increased by over 200% from 2011 to 2013 and the number of terrorist attacks jumped by nearly 250% from 2011 to 2012. Political violence was also on the rise in Togo, Ghana, the Ivory Coast and the DRC. Although West African leaders met during the summer of 2013 to plan an assault on piracy and pirate groups, insufficient resources and too few naval patrol craft will likely hamper their efforts. Permitting foreign-armed guards on merchant vessels transiting Nigerian waters may be a next step in countering this maritime threat. Clearly, though, conditions on land must improve before the piracy threat will disappear. Weak states, joblessness, and abundant targets currently ensure that piracy will continue. do you ever wonder what you’re gazing at? 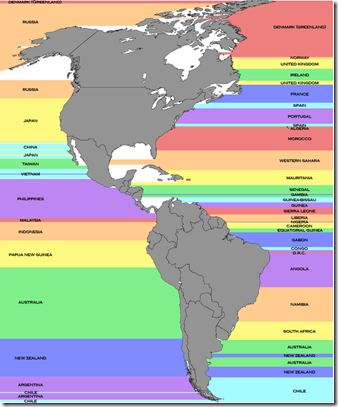 With this graphic, you can see what’s in your line of sight at any beach in the Americas. The map above shows the countries that are due east and west from points along the coasts of North and South America. Many small island nations are (perhaps unfairly) excluded for ease of reading. Many thanks to Eric Odenheimer for sharing the map with Know More. Thirty two years after the first of his seven attempts, French ocean racing star Loick Peyron won the Route du Rhum - Destination Guadeloupe this Monday morning (TU) when he crossed the finish line of the solo race from Saint-Malo France to Pointe-a-Pitre at 04:08:32 TU/05:08:32 CET/00:08:32 local. The lone skipper of the 31.5m (103ft) Ultime trimaran Maxi Solo Banque Populaire VII completed the 3,542 miles course in 7d 15h 8m 32s. Peyron sailed the 3,524 NMs theoretical course at an average of 19.34kts. In reality he sailed 4,199NM at an average of 22.93kts. Skipper of the 14 man 2011-2012 Banque Populaire crew which holds the outright Jules Verne Trophy sailing non-stop around the world record, Peyron has a longstanding special affection for La Route du Rhum as it is the Transatlantic race which launched his solo ocean racing career as a 22 year old. Until today he had finished fifth twice and was forced to abandon three times in the ORMA 60 trimarans in 1990, 1994 and 2002. At the age of 54, his Route du Rhum triumph is another new summit for the sailor from La Baule, Brittany who turns his hand with equal skill to all disciplines of sailing from foiling Moth dinghies to the giant multihulls as well as the America’s Cup. Ironically he was only enlisted two months ago to replace skipper Armel Le Cléach’h who injured his hand. Maxi Solo Banque Populaire VII’s win was built from the first night at sea. After negotiating a difficult upwind section Peyron was the first to turn off Ushant, perfectly timing his key passage through the front. He opened his lead in almost all sections of the course, except momentarily when he lead into a bubble of light winds under the Azores high-pressure system. But his approach to Guadeloupe regained distance and when he crossed the finish line second placed Yann Guichard on the 40m Spindrift was 180 miles astern. It is the second time in a row that the race has been won by the same trimaran, which was designed by VPLP. In 2010 Franck Cammas won on the same boat when it was Groupama, in a time of 9 days 3 hours. His win is all the more remarkable for the fact that Peyron stepped in for the injured Le Cléac’h only two months ago and many times pre-start in Saint-Malo he voiced his concerns about the magnitude of the physical challenge he faced, playing down any suggestions or expectations. In fact Peyron had originally planned to sail this Rhum in a tiny 11.5m trimaran called Happy. But his vast experience and technical skills on multihulls filled the gap, complemented by the accomplished skills of his routers ashore – who plot his course for him – Marcel van Triest and Armel Le Cléac’h. His two ‘guardian angels’ kept his course fast, simple, smooth and safe. First words from Loick upon arrival: “It is a very nice victory but a team victory. I was not supposed to be on this boat two months ago. I was supposed to do the Rhum race on a very small yellow trimaran, which will be the case in four years time, I will be back. But it is not a surprise because I knew that the boat was able to do it. I knew that the team was able to help me a lot. "It was really tough, but I am really impressed by the job that Yann Guichard has done since the start. His boat is bigger, this boat is big but it is nice.